Background: The use of pseudocereals is of great nutritional interest because of their peculiar chemical composition and other components found in these grains. Pseudocereals are significant sources of various bioactive components including phytosterols, polyphenols, saponins, fagopyritols and certain essential minerals but some of them are unavailable because of the presence of some anti-nutrients such as tannins and phytates. Objective: The aim of this review was to summarize the recent studies regarding nutritional quality, the effect of processing and potential health benefits of pseudocereals. Conclusion: Pseudocereals are subjected to various processing treatments like puffing, fermentation, germination and cooking to improve their organoleptic and nutritional characteristics. All these processing treatments cause an alteration in the nutritional quality either by reduction of antinutrients or an improvement in digestibility or availability of nutrients. Also, pseudocereals are gluten-free grains, therefore their flour or products can be used by the persons suffering from celiac diseases. In addition, because of the potential health benefits, pseudocereals are now receiving more interest from nutritionists and food scientist. Keywords: Pseudocereals, buckwheat, amaranth, nutritional value, processing, health-benefits, applications. 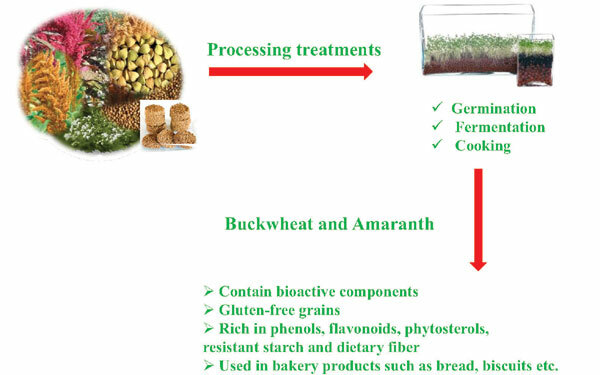 Keywords:Pseudocereals, buckwheat, amaranth, nutritional value, processing, health-benefits, applications. Abstract:Background: The use of pseudocereals is of great nutritional interest because of their peculiar chemical composition and other components found in these grains. Pseudocereals are significant sources of various bioactive components including phytosterols, polyphenols, saponins, fagopyritols and certain essential minerals but some of them are unavailable because of the presence of some anti-nutrients such as tannins and phytates.